Coach's Corner - Bon Jovi BAND-SIGNED/GUARANTEED electric guitar by original guys-new Rock n Roll HOFers. Go Back to Lot List Bon Jovi BAND-SIGNED/GUARANTEED electric guitar by original guys-new Rock n Roll HOFers. This mint black n brown electric guitar has a white pick guard and comes signed by 4 original members of this recently inducted HOF band! 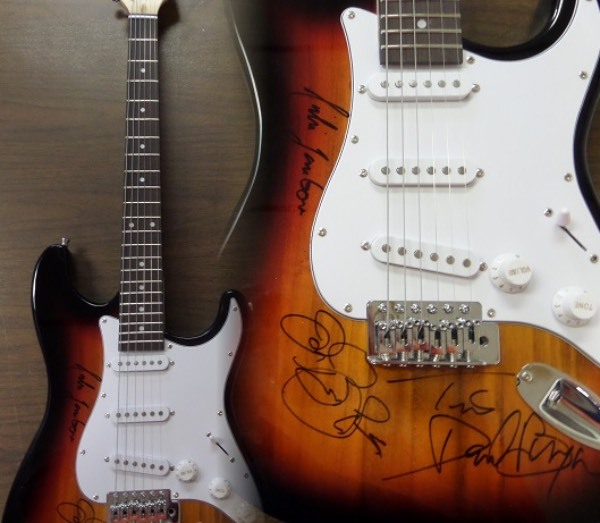 The autographs are GORGEOUS and included are JON BON JOVI, TICO TORRES, RICHIE SAMBORA, & DAVID BRYAN. Guaranteed authentic and retail rising into the high hundreds/low thousands now.